Design as per is : 16018. Foam fire Extinguishers Extinguish the fire by taking away the heat elements of the fire triangle. foam agents separate the oxygen elements from other elements. 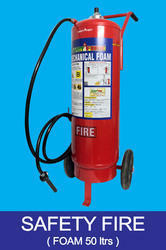 Foam extinguishers are supplied in both cartridge and stored pressure formats and confirming specification IS 10204 9 Ltrs Capacity IS 13386 50 Ltrs capacity and NFPA international standard. Specification: Foam extinguishers are supplied in both cartridge and stored pressure formats and confirming specification IS 10204 9 Ltrs Capacity IS 13386 50 Ltrs capacity and NFPA international standard. The high quality range of Fire Fighting Equipment like Mechanical Foam Fire Extinguisher that we procure from reliable vendors is critically approved by clients for excellent design, high performance and long service life. These are fabricated according to pre-defined quality standards. The range is subjected to meticulous quality tests to ascertain glitch free features. 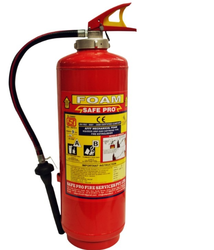 The Mechanical Foam (AFFF) Fire Extinguisher is an ideal solution for A & B class fire that includes paper, wood, clothes, oil, paints, thinner, spirits, plastics and petrol. Besides, we manufacture these extinguishers using premium grade raw material that is in adherence with the international quality regulations.